Over the span of your life, teeth tend to weaken, becoming more susceptible to decay, cracks, discoloration, and other problems. Solutions like a filling or bonding aren’t always sufficient. In this case, your dentist will likely suggest new dental crowns. Crowns can be made from anything from porcelain to full gold. While a flashy gold crown does sound fun, Dr. Santarsiero suggests you leave those to royalty, and encourages his patients to choose porcelain as it can be matched to the shade of your other teeth, and will appear the most natural. Since new dental crowns typically last anywhere from 10-15 years, you may thank us in the long run! The crown process takes two visits, and some local anesthesia. The dentist will file down the enamel on the tooth in question, reshaping it for the new crown. 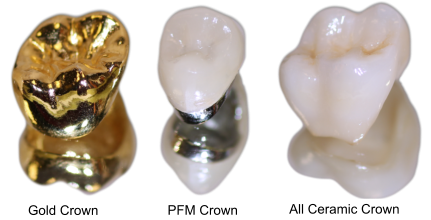 Then a mold is taken of the tooth and sent to a lab, where your new crown will fitted to your exact measurements. We’ll fit you with a temporary crown while you wait the two-three weeks necessary for the lab to create and send your permanent one back. Once in, your follow-up visit will be focused on fitting the new crown in and cementing it in place. The dentist then runs a few quick bite tests to make sure it fits in line with your other teeth, and makes any adjustments needed. When you look in the mirror you should see your same, beautiful smile, just a little more durable. As long as you floss and brush regularly, your crown should keep protecting your tooth for many years to come!